Diaper Cakes Make Great Baby Shower Gifts – How To Make Your Own! Following are some tips for making your own diaper cakes, plus some places to order diaper cakes online. That way, you can have it delivered to the new parents — at the hospital or at home. 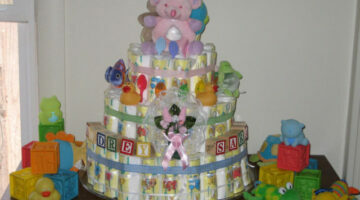 Or have the diaper cake delivered to you, and you can take it to the baby shower! Baby Names: 7 Tips For Choosing A Unique And Modern Baby Name That Your Child Won’t Hate! How do you choose a name for your baby that is unique enough to make your child feel special, but not so unique that he wants to change it at the first opportunity? Here are 7 ideas, plus links to lots of helpful websites & the best baby naming books! You’ve heard of Baby Mozart and the Mozart effect, right? Well, the iPod Baby Belt is along those same lines, and it is fast becoming one of the newest fashion interests for mothers-to-be. Here’s the scoop. At first I wasn’t sure what you could get a guy that would relate to his becoming a father. I didn’t know if there were gifts geared towards dads-to-be, until I went shopping. Here are my top picks as gifts for new dads. Here are some great gift ideas for the mom-to-be… From the practical gifts every mom needs to the creative and unusual gifts for the mother to be — and everything in between. 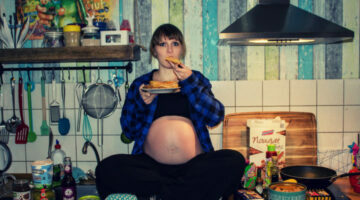 Here are some of the more unusual pregnancy food cravings and what they might mean — for you and your baby.